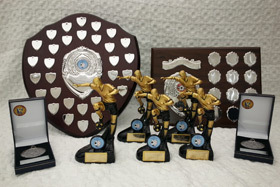 The Ruggles & Jeffery sponsored Annual Presentation Evening was another great event last night. For the third year running we had close to 100 people attend, enjoying an excellent party atmosphere throughout the whole evening. Trophies and awards were presented by Brian Ruggles, Joint Managing Director before everyone enjoyed an excellent buffet which was followed by plenty of drinking and dancing to the superb DJ and his enormous sound system. As well as the individual club trophies, the First Team collected their League Medals for finishing Runners Up in Division 3 last season and the Under 14 Team were presented with the Junior League Fair Play Trophy – an achievement to be very proud of.